In Praise of our Outlander XT ATV for the Homestead. Including a Cheap and Easy Log Skidding Cone. It's the rare time I am on the ATV for any more than a few moments that I don't appreciate just how valuable an addition it has become to us. When I compare doing identical jobs with the ATV as compared to the tractor, I can't help but shake my head at how much better that ATV is for the small homesteader. About the only chore that the tractor could claim to be superior would be skidding multiple logs on clear, flat, open terrain - an amazing rarity here on the homestead. I haven't added chains to the wheels as yet, but so far I don't know how much difference they would have made. We have managed to skid everything (with varying degrees of difficulty) we have wanted to so far. Some of the larger logs did prove to be quite a challenge. I had given up on two of them, after describing to Grandpa the use of skidding cones by people with larger budgets than mine. He took it upon himself to winch the last two monster logs up the unclimbable slope, and then dismantled his old wheelbarrow and turned it into a thrifty log skidder. Our first attempt to use it proved questionable. Once moving, I kept trying to increase speed on the ATV as this was the best practice in previous attempts... 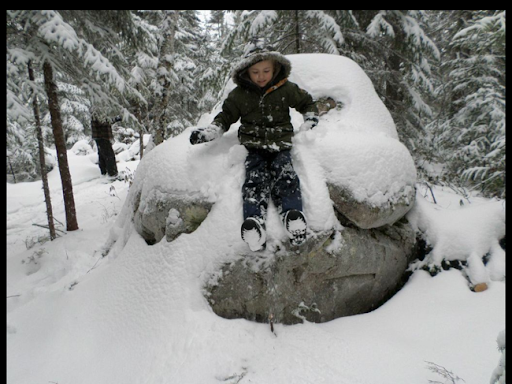 It allowed the log to have some momentum and break through smaller obstacles. With the skidding barrow (cone? No, that's not quite right...) in place, the extra speed was a liability that caused it to tip over and lose all usefulness. I found that by easing off to a brisk hike, the log kept itself on the flat portion of the barrow, and slid over the small imperfections in the trail. It was a real winner! 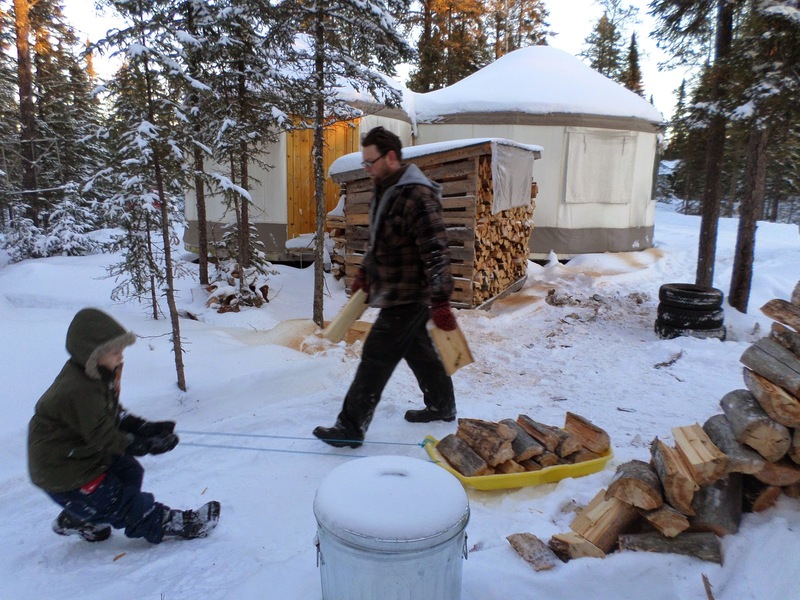 Grandpa had planned on only taking out a single log as proof of his concept, but it went so slick, we rushed back to the bush and easily took out the other one as well. We had won! We had skidded out the largest portion of the tree, at a 10' length! 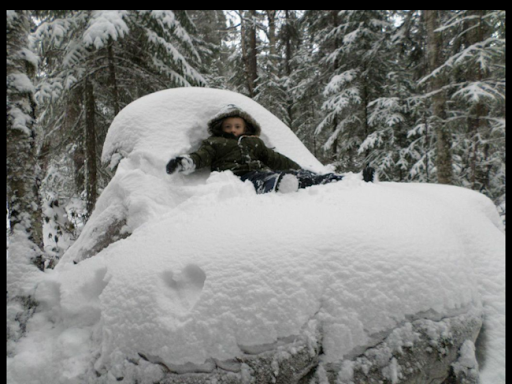 Credit to the ATV, and to Grandpa for his persistence. I am often quick to abandon a project in favour of coming back to it much later. He keeps thinking. Ploughing snow with the ATV is so much nicer than craning my neck on that old tractor. As well, it actually starts even when the thermometer is below zero! Problem though - I hadn't thought of it much before, but the plough was attached to the framework supporting the foot rests of the ATV. Last year when first purchased, I noted that it wasn't aligned straight to the ATV, and so the plough always canted a bit to the right. No problem, I generally kept it sloped that way anyway when ploughing. After the first use or two against snowfall, I noticed that it seemed to be favouring the right side of the ATV even more than usual. Climbing down and looking underneath, I was unamused to note that the framework of the foot rests had been badly swept backwards, likely due to the strain placed by the plough hitting hidden stones or heavy snow. Sigh. Luckly KC Automotive was willing to take a look at it for me. I even suggested that I would be willing to pay to have them drill out the frame and add some cross bracing to help it. Yesterday late in the afternoon the internet was still out (due to the temperature, our solar charge controller ups the voltage to the batteries so high that the inverter feels there must be a fault with the system and cuts out - don't get me started on our power situation!). I asked Mama permission to go out to the bush and retrieve some more firewood. I didn't have any specific tree in mind, there are so many candidates on the trail. I headed to the end and found a nice one that looked well suited. It was also closer to the trail than I had recalled, so I opted to cut it first. I had managed to get it to fall across the trail, where the top had conveniently broken off anyway. I backed the ATV up, hooked it on and hit the gas. Humming my jazz tunes to remind me of my recent video record of this trip, I could feel the ATV pull against the weight of the tree and drag it from the bush and along the trail. I have gotten use to the feel of the machine to such a degree that I can now tell mostly by feel when or if my log has become detached, so I don't have as much a need to keep checking over my shoulder to confirm that it is still there. I drove out of the bush without glancing back. Imagine my surprise when I got back to the cabin and discovered that this log was well over 30' long! Kenny, at about 4' measured out nine lengths of himself against it. With the sun low in the sky (when isn't it at this time of the year? Two more days until solstice! ), I bucked it into stove lengths, and then split it down even more. I was about to call it a day when Donna and Kenny arrived to help me pile it by the back woodsheds - what a team! Everything is so nice when we all pull together! Sometimes it's nice to sit in a natural comfy chair. And then just slide right off the end. Oh, but snow can go up your back. Generators. Ugh. When you are off-grid in Canada, you really do need to have experience with them. I would love, LOVE it if I could easily find or make a steam powered version. Now THAT is something I could get behind! In the meantime, I have to make due with regular gas ones. I'm thinking that gas is currently ubiquitous, and it's easier to get it serviced locally (At KC Automotive down the road...). We don't need a huge one to charge our batteries here at the homestead - we are still pretty small and only use our electricity for the refrigerator, lights, water pump, washing machine, television screen, Internet, and charging electronics and batteries. At least, in winter... In summer when we can see that we have a surplus, we do allow ourselves the slow cooker on sunny days - that's really awesome! I do hope to double or triple our solar capacity in the near future, but for now, we make do with what we have. Here are my experiences with generators so far. This is just my experience, not any sort of advice or buying guide, although I may intersperse my discourse with my perceptions, rather than just my direct observations. 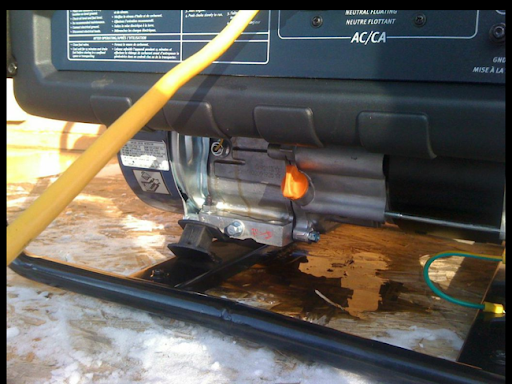 The first generator I purchased was a Champion 3000/4000 watt model from Canadian Tire. It has good power available for charging, although I have noticed that it seems to only produce about half the rated capacity in each of the circuits it has for plugging in. Thus you are more limited to 1500 watts on anything you wish to use. This generator is still going for us - it has been down to KC numerous times for different issues - dirty fuel line, dirty carb, bad low oil sensor and most recently - bad spark plug. K! reports that in his experience Champion generators just "wear out" after awhile. I am okay with trying to keep this machine going, but I've learned that you cannot rely on it. Which brings me to a thought - when I'm off grid and about to use the generator - it's not because I want to. It's because I *need* to (usually batteries are down to 50% and there is no sign of solar charging in the near future). This means that if the generator doesn't go, we're instantly in a serious pinch! As such, it has led me to the unfortunate conclusion that in my present circumstance, we need to have TWO generators ready to go at any one time. The next generator I purchased was a King Canada 950 watt model from Tool Town. It was cheap - $150 on sale. It was also a 2-cycle engine which I confess gave me pause while I thought of the environmental consequences. It ran quietly and well for us for a few summer months, before the starting clutch self destructed. I had it for repairs many times until it was finally replaced. The new one ran worse, although it did start. It is currently sitting in the back of the dojo tent, apparently in working condition (although I suspect only in 15+ degree weather, as I couldn't get it to start last time I tried.) I cannot, CANNOT recommend purchasing this generator. There is even someone online who had one set itself on fire, in case you want something else to worry about if you decide to use one of these. We relied on the original Champion 3000/4000 for the most part since we have been off grid, but about six weeks ago it quit just when the batteries were quite low, so I decided that in spite of finances, we needed to backup. I dropped it off at KC and proceeded down to Wal-Mart where I passed on their cheapest 2-cycle option, and instead went for their 3250 watt option. 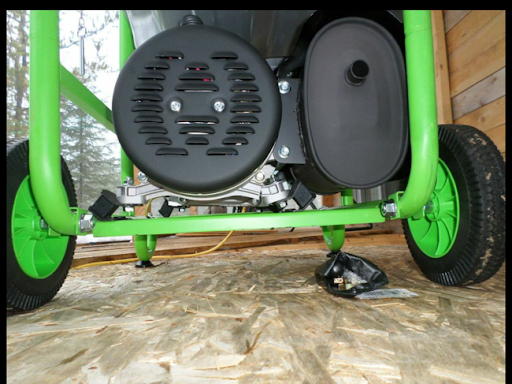 I have to say it wasn't bad - it had wheels and and handle for moving, and it always started by the second pull. My in-laws reported that it was noticably louder than the Champion, but from what I could see it was almost identical. I figured it was, but just rebranded and in a slightly modified frame. I went to do the first oil change, and that's when I noticed that the aluminum strut from the generator to the frame was completely snapped off. This was disappointing. I loaded it up to exchange at Wal-Mart, but they didn't have any other generators there, so I simply returned it and headed back to Canadian Tire to see what they were offering. They had a model similar to my original on sale for slightly less than the Wal-Mart brand, and it got really good reviews online. I purchased it and brought it home. Loaded it with nice oil and started it up. It worked really nicely. Then it stalled again (for no reason). Then it started to run pretty rough. I was done with it for the day, and a few days later started it up again and left to run some errands in town. Donna texted me to report that the inverter/charger said it wasn't producing any current, and then texted me soon after saying the generator was making lots of noise and smoke and an ugly liquid was running out of it and she was shutting it off. While in town, I headed straight to Canadian Tire and bought their small Champion 1200/1500 watt generator. I had eyed this model right from the start of our venture, but felt it may be too small. It was on sale for only $200 with a 2 year warranty. I figured that if I can actually get two years out of it, then it probably could be looked at as a "lease" that was within the budget. I returned the other generator (which wasn't Champion - it was Canadian Tire's Mastercraft house brand). They accepted it without complaint when I explained the multiple issues it has exhibited. I'm not sure what was wrong with it. As an afterward, I do really like the new, small generator, but it isn't without its own issues. The inverter charger asks much of it to charge the batteries, and when the fridge kicks in, that can sometimes cause it to fault out with an overvoltage condition. This means we have to go out to the generator and unplug it and then plug it back in. I'm not sure what the answer will be to this issue, aside from perhaps turning off the fridge for a few hours while we charge the batteries from the small generator. Ultimately I would like to build a small generator "shed". I picture something almost like an old fashioned well - it would have a cover to keep the generators out of the weather, but still be open all around for good access and ventilation. 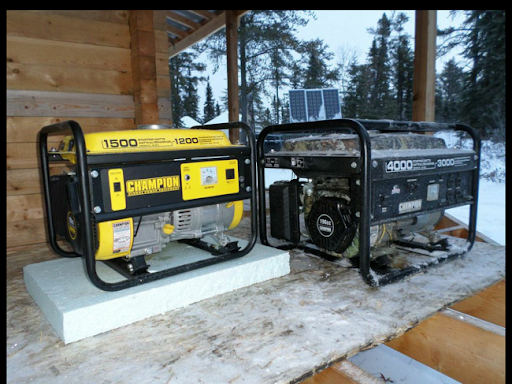 I could have both generators positioned together and simply alternate between the two for charging. If I come up with any fundamental changes to my system or thoughts, I'll try to note them in a future post. Is it work if you enjoy it so much? 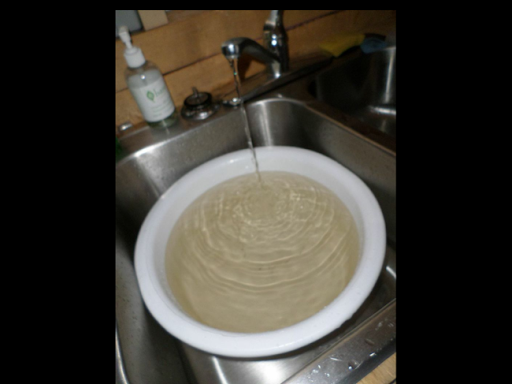 As much as I don't want to report on water, it is something that our lives revolve around, and I want to help out those who come after and may want to imitate the experiments in our lives that are successful. So anyway, this morning I started the sauna before sunrise, to try to warm up the pipe there, and the tanks there. I have a hunch that it is the pipe in the wall of the sauna which is the problem. I may go as far as to cut an access hole in the wall and try to insulate that pipe, and see what difference perhaps that may make. I also started up my new generator to let me run the heat cable for a bit and see if that also helps. I'll try to post my generator thoughts and woes soon. Previously I managed to get the water flowing well, and at the same time decided to give a good mopping of the inside of the water tanks (there was some notable sediment there...) Shortly after stirring up the silt, I noticed that my water flow inside the cabin was abnormally low, in spite of the sauna and heating line having been warmed up. This prompted me to feel that something other than ice was at play. I then thought back to having cleaned the tanks, and wondered where the silt would have gone once it went out of the tanks... Into the bottom of the line that travels from the sauna to the cabin? And then did I really have enough pressure at the best of times to flush that out? Not likely... So it must have been accruing down there. Sigh. 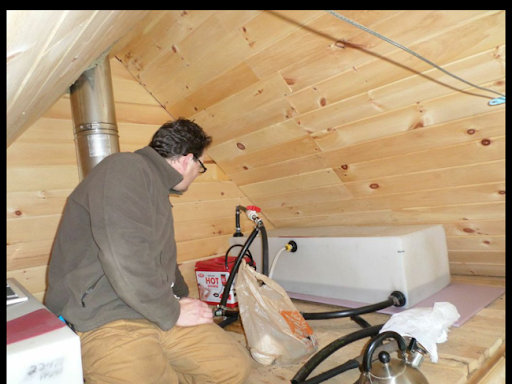 First up - I replumbed the sauna lines so that the well pump would pump directly to the cabin. This increased the pressure notably and blew some nasty looking water into the kitchen. 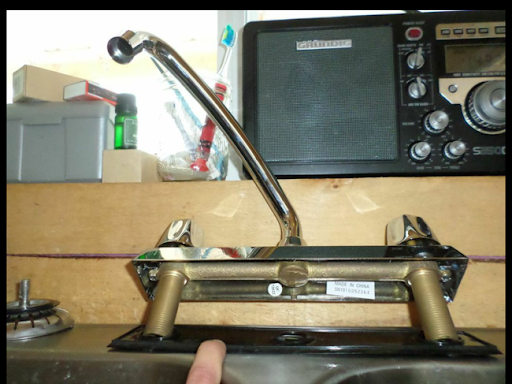 Second up - I replaced the kitchen taps with a "cheaper" set, that had the advantage of not feeding the water through a tiny little "straw" of a pipe. 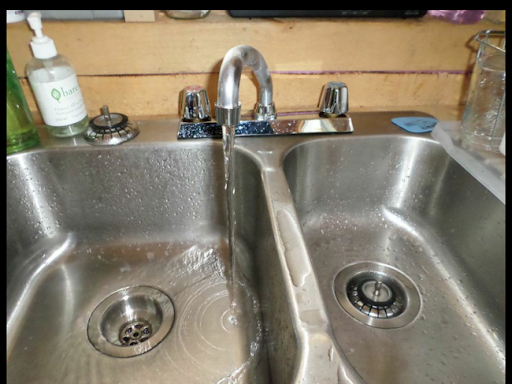 These taps could open up much more notably. And low and behold, better flow than we had ever had before! Now we need to find the magic formula to keep the water flowing between buildings... My heating line seems to open things up in a pinch, but now I think our next step will be daily fires in the sauna to try to keep its ambient temperature from going too far below freezing. 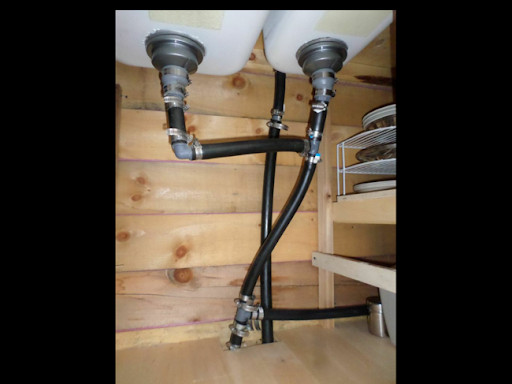 Of course, we will also continue to keep the tap dripping inside to help ensure water flow. Over Christmas, I will likely add the RV antifreeze to the line as well to try to keep it from freezing while we are gone. As always, stay tuned, and send us your positive, wet thoughts!